For other uses, see Patio (disambiguation). 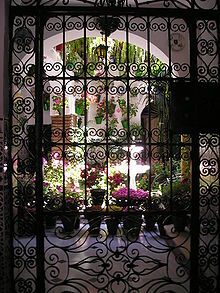 A patio (/ˈpætioʊ/, from Spanish: patio [ˈpatjo]; "courtyard", "forecourt", "yard") is an outdoor space generally used for dining or recreation that adjoins a residence and is typically paved. In Australia the term is expanded to include roofed structures similar to a pergola, which provides protection from sun and rain. Patios are most commonly paved with concrete or stone slabs (also known as paving flags). Patios can also be created using bricks, block paving, tiles, cobbles, or gravel. Other kinds of patio materials these days include alumawood, aluminum, acrylic, and glass. Patio options include concrete, stamped concrete, and aggregate concrete. Stamped concrete costs more, is known to be slippery, requires being resealed, and dyes typically fade in time. Aggregate concrete uses stones exposed giving its own style. Other common patio features include additional of reinforcement for hot tubs and additional steps from the home. ^ "Patio in the Oxford Dictionary". ^ Department of Planning. "State Planning Policy 3.1 - Residential Design Codes". Retrieved 9 October 2017. ^ Fwa 2005, p. 10-. Chisholm, Hugh, ed. (1911). "Patio" . Encyclopædia Britannica (11th ed.). Cambridge University Press. British Precast Concrete Federation (1973). Paving Flags (to B.S. 368: 1971). British Precast Concrete Federation. Mildenhall, Henry Seymour (1983). Laying Precast Concrete Paving Flags. Cement and Concrete Association. ISBN 978-0-7210-1288-9. Fwa, T.F. (28 September 2005). The Handbook of Highway Engineering. CRC Press. ISBN 978-1-4200-3950-4.